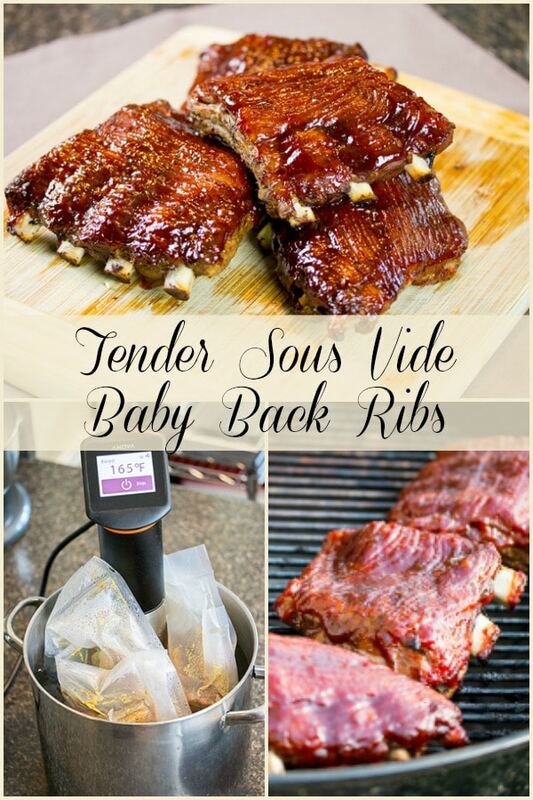 Sous Vide Baby Back Ribs are a perfect way to get tender baby back ribs when you just don’t feel like hanging around outside with the smoker. I think my sous vide baby back ribs are off the chart and I have to thank my sous vide machine for all of the magic. I love my sous vide machine. I don’t mean like kind of love. I really love it. It’s my favorite kitchen gadget. My wife and I use it at least once a week. There isn’t much I have cooked with it that didn’t turn out absolutely fantastic. All of my steaks start out in the sous vide machine as well. You can read all about that method here. I also love baby back ribs, but there are some days I just don’t feel like screwing with my smoker. One rainy weekend I really wanted ribs but didn’t feel like babysitting the smoker in the rain, so I had the brilliant idea of doing some research on sous vide ribs. There’s a lot of information on the interwebs about how to sous vide a large variety of meats, including baby back ribs. The variation in information, techniques, and results are wide, so I am giving a rundown of my preferred method of cooking sous vide ribs. I don’t like tough ribs. I actually prefer my ribs to be almost fall off the bone tender. So in this recipe, we’re going to aim for some delicious fall off the bone sous vide baby back ribs. Good Sous Vide Baby Back Ribs begins at the grocery store. Get your ribs from your local butcher or go with an organic brand if you can. I haven’t had good luck with the megastore brands like Tyson, so I avoid them at all costs. However, YMMV. 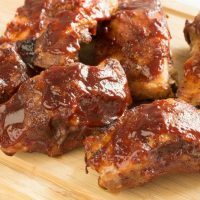 When buying your ribs, you want to look for a rack that’s got an even thickness across the whole rack with no bones sticking through any of the meat (shiners). Once you get your ribs home, you’ll want to pull them out of whatever packaging you bought them in and pat them dry. There might be a membrane on the backside of your ribs. Check out this video on how to remove the membrane. 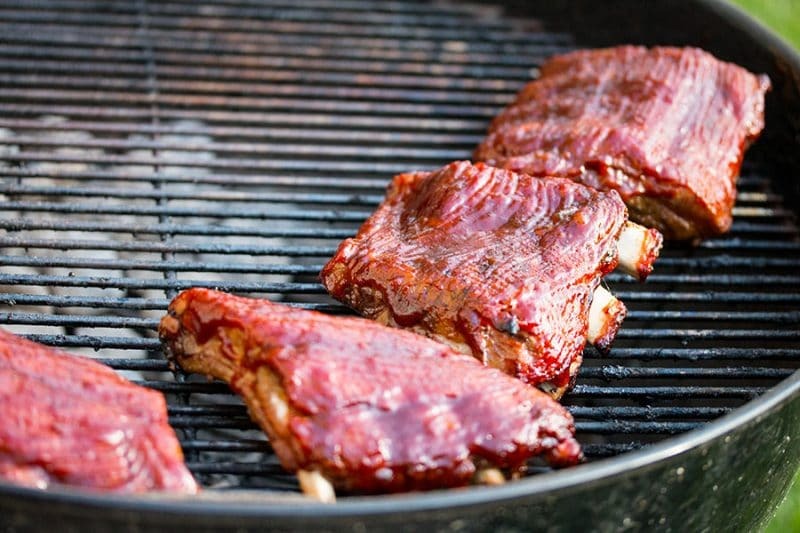 For this recipe for Fall Off the Bone Tender Sous Vide Baby Back Ribs, you’ll need a full rack of ribs, a quarter cup of yellow mustard, and a quarter cup of liquid smoke. Cut your ribs up into three or four smaller portions. Since we aren’t smoking these ribs, I like to coat the ribs in mustard and liquid smoke to give them a more BBQ-like flavor. Mix together the yellow mustard and the liquid smoke. Brush the mustard and smoke mixture onto the ribs. Then coat the ribs in your favorite BBQ rub. 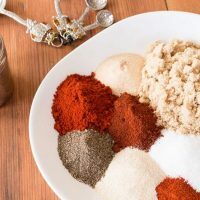 I highly recommend using my super simple versatile BBQ rub because it actually goes really well with this recipe. 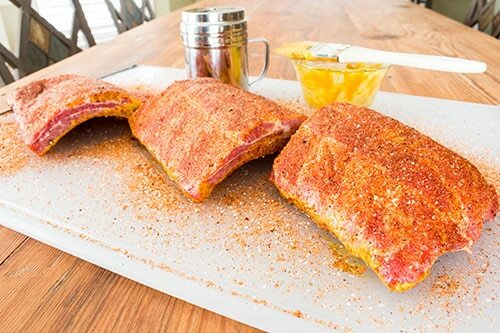 After you have your ribs well coated, place them into vacuum bags or into heavy-duty freezer bags. Remove as much of the air from your bags as you can. Set your sous vide machine to 165 degrees F.
Place the ribs into your water bath and cook for 9 hours. 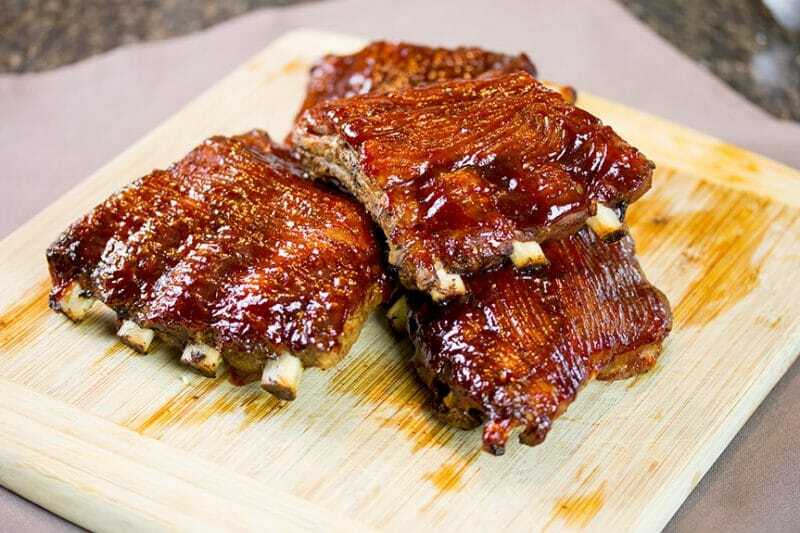 If you don’t want your ribs to be fall off the bone tender, then you can try cooking them 6 to 7 hours. Your mileage may vary but experiment with the cooking time. After you sous vide your ribs for however long you want to cook them, pull them out of the bags. Do not clean them off or pat them dry. Let whatever sticks to them stay. We will let them dry on the grill and the more goodness that’s left on the ribs the better. Preheat your charcoal or gas grill with a two-zone fire. 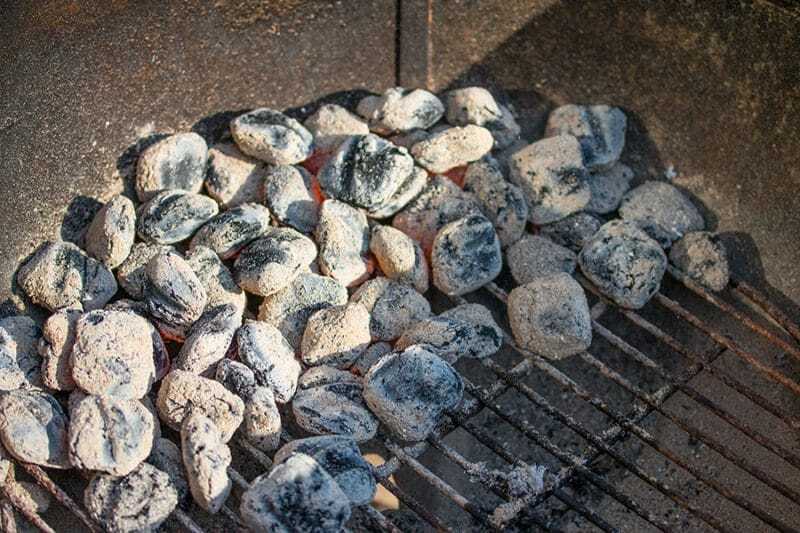 Place all of your charcoal on one side of your grill or turn your gas on so that only roughly half of the grill has flames on. This setup gives your grill a hotter side and a cooler side. Place your ribs on the cooler zone meat side up. Put on the lid and let cook for 5 minutes. 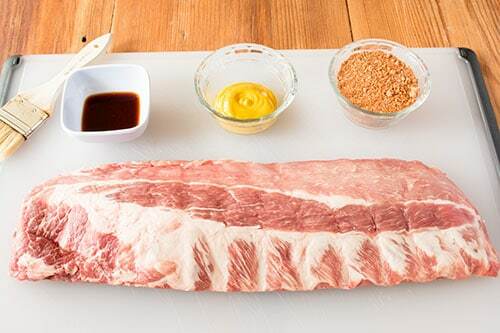 Remove the lid and glaze your ribs in your favorite BBQ sauce. Cook the ribs for another 5 minutes. Put another layer of BBQ sauce on your ribs and cook 5 more minutes. If you’d like some char on your ribs, put the ribs meat side down over direct heat for 20-30 seconds. Be careful and keep a close eye on your ribs if you go this route. I normally don’t do this route because I’ve had too many problems with the sauce sticking to the grates or burning the sauce. However, once your ribs are done to your liking, pull them off the grill and let them cool for 10-15 minutes. I like to cut my ribs into individual ribs to serve. 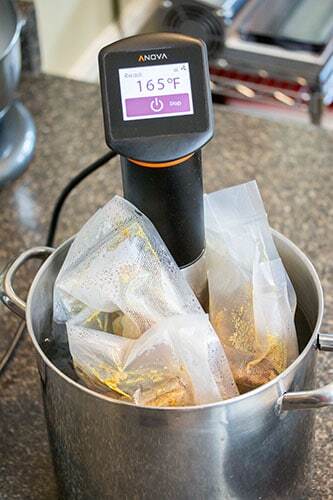 Here are some links to tools that you might find useful for sous vide cooking. Anova sous vide machine I use. 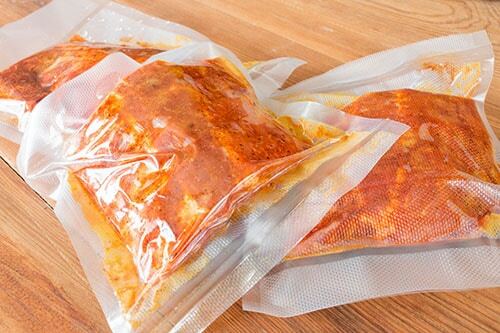 Starter Sous Vide Bag kit you can always upgrade to an electric vacuum sealer if you decide to sous vide all the time. Of course, you will also need to buy sealing bags separately when you choose this route. Don’t forget to follow us on social media using the follow buttons below. 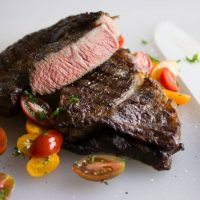 Check out these other great meat recipes and ideas from our kitchens! 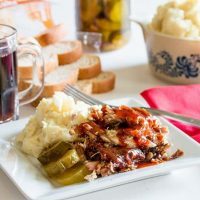 A simple and versatile Sweet and Spicy BBQ sauce that is a favorite on the grill and smoker. 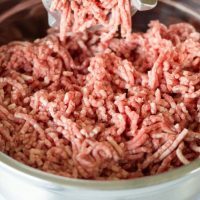 Also, add yourself to the mailing list to be notified whenever we post new recipes and cooking articles. Don’t worry, we hate spam too! We won’t email you unless it’s about a new post. Thanks for stopping by! Great tip! That’s how I char my Slow Cooker Ribs! I actually ruined one of my favorite baking pans this way. If you want char/bark without the ribs sticking to the grill, try finishing them under the broiler in the oven. You can try 5 hours on the ribs and they will just have a bit more “bite” to them. You can also try turning your temperature up to 167 Degrees F.
If you don’t quite have 6-7 hours would you recommend increasing the sous vide temp? If so, to what temp for 5 hours in the bath? These were the most tender ribs! Will be using this method a lot.